Guilty Gear Xrd will be getting an updated version, called “Rev 2”, and it will be coming to PC (as well as the PS4 and PS3). Rev 2 was announced at the Arc System Works Fighting Game Awards 2016. 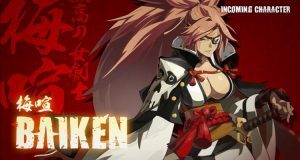 During the event, a trailer was shown that also revealed that characters Answer (a “business ninja”) and Baiken, which will be added as playable characters in an update. Baiken returns from previous Guilty Gear games, while Answer makes his playable debut—he appeared as a character in the Story Mode previously. General director Daisuke Ishiwatari and battle planner Kazutoshi Sekine detailed some of the content in Rev 2, discussing new balance adjustments and techniques for existing characters. There’s going to be a new scenario added to the story mode, in addition to new episodes for characters Jam Kuradoberi, Raven, Kum Haehyun, Dizzy, Baiken, and Answer. Allegedly major improvements have been made to the online mode. More features will be announced in the future. Rev 2 launches in arcades in spring 2017, but no release date for PC has been announced. Those who already own Guilty Gear Xrd Revelator will be able to upgrade to Rev 2 through the purchase of discounted DLC. Revelator is currently $50 USD on Steam, so it’s possible Rev 2 will cost the same for first-time buyers.